On Friday night the MAC Championship Game will be played on at Ford Field in Detroit. This is the 14th annual MAC Championship Game. Northern Illinois is looking for their first win in the championship game, and Miami (Ohio) is searching for their second. 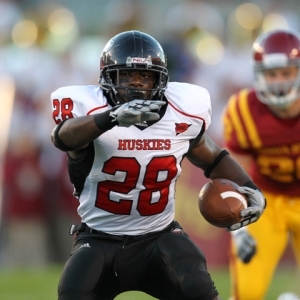 The Huskies of Northern Illinois went 8-0 in MAC play, while the RedHawks of Miami went 7-1. Miami went just 1-11 overall last year, so the fact that they have made it to the MAC title game is an impressive feat. This is the first of the conference title games slated for this weekend, and ESPN2 will have coverage of this game Friday evening. Miami’s offense has been less than spectacular this year. Zac Dysert was the starting quarterback, but he was injured in early November and Austin Boucher has stepped into the starting role. The team hasn’t asked Boucher to do a lot in his two starts, but he has done a nice job taking care of the football. Thomas Merriweather is the leading rusher for this team, and I would expect him to receive more carries than normal with Dysert on the bench. Merriweather has run for more than 100 yards in both of the last two games. The Northern Illinois offense was the best offense in the MAC all year long. This is a team that has one of the best running games in the entire nation. Chad Spann has racked up 20 touchdown runs already this year, and he is averaging 5.5 yards per carry. Chandler Harnish is the signal caller, and he is a great runner as well. Harnish averages 6.4 yards per carry on the season. The passing game is definitely good enough to keep the opposition honest. Harnish completes 66 percent of his passes and he has 17 touchdown passes on the year. This offense averaged an impressive 39.2 points per game this year. The reason Miami is in this title game is the solid play of their defense. The RedHawks defense was solid against both the run and the pass during the regular season. Miami has allowed just 12 points per game in their last four contests. The front four does a nice job pressuring the quarterback, which allows the secondary to sit back in coverage. Miami has sacked the opposing quarterback 29 times this year. The Northern Illinois defense may not get the publicity that their offense receives, but they have done a great job as well. During the regular season, Northern Illinois allowed just 18.5 points per game. The Huskies have a great secondary, which makes it very tough on their opposition to air it out. Northern Illinois will almost certainly gear up for the running attack of Miami in this one, and force Boucher to beat them with his arm. The Northern Illinois Huskies opened as 14.5-point favorites in this one, according to college football odds, but the line has risen throughout the week. Northern Illinois is now favored by 17.5 at most books. The posted total opened at 51.5 points, but it has since risen to 55 points. I would expect both numbers to continue to trend the way they have been moving up until kickoff. Northern Illinois has dominated the MAC this season, and they are 7-0-1 ATS in their last eight conference games. The ‘under’ is 7-0 in Miami’s last seven games overall. The ‘over’ is 8-3 in Northern Illinois’ last 11 games. The underdog is 5-2 ATS in the last seven meetings between these two teams. The RedHawks have had a nice season, but I don’t think they have the talent to upend Northern Illinois. The Huskies have been blowing out their opposition all year, and I think they’ll do it again in this game. I like the Huskies to cover the large number here.